I don’t typically write about rumors as I don’t want to report things when I don’t know or trust the source. Many things are used as click bait and that’s just not cool. But when certain rumors get reported by multiple sources, and sometimes are backed up with some evidence (like permits filed publicly, etc) then we can assume there’s a strong chance that there’s something to them. Since so many are going around at the moment I wanted to share a few with you guys under this huge disclaimer: these are NOT certain. They aren’t verified by the Disney company and can easily never happen or end up being something totally different. Now that we got that understood, lets talk about some potential new projects that are being rumored. We already know about several new resorts in progress, these include the tower currently going up at Coronado Springs, the Riviera DVC Resort (near Caribbean Beach) and the Star Wars Resort (not yet begun construction) near Star Wars Land. But now there is talk of a new hotel coming to Epcot in the front of the park near the entrance to Future World. The resort is expected to extend from the park entrance to the West, wrapping around the back of The Seas Pavilion. The information comes via permits and plans filed through the county. 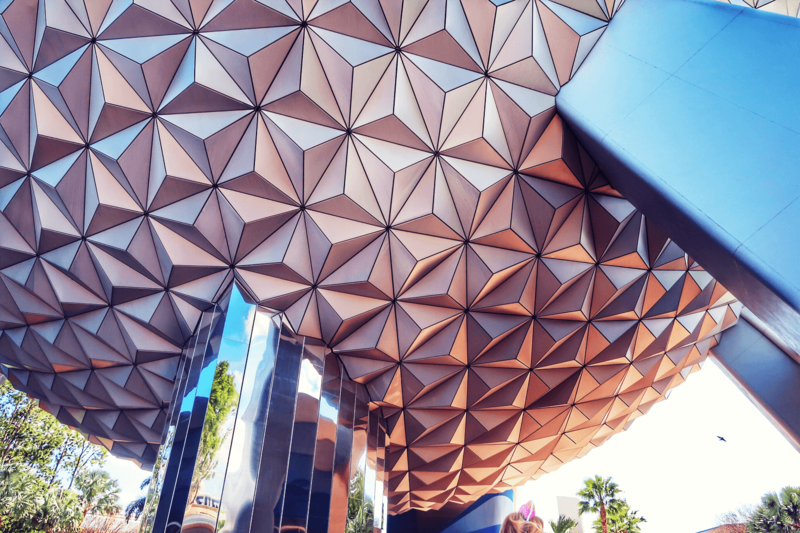 The plans feature the label, “Epcot World Center” directly on Spaceship Earth, which could hint to a re-naming or re-theming of Future World and/or Epcot as a whole. There seems to be two potential areas for the resort to stand, as well as a new pond/lake feature making it a “waterfront” resort and shifting Epcot’s parking over to accommodate the new construction. In the picture below you can see a close up the proposed resort area in green and the new pond. If it is located in this area, the hotel may be like the ones found at Disneyland Paris and Tokyo DisneySea, where guests entering the park pass under or through a hotel. Whether this resort would actually stretch across the entrance to the park or off to the side closer to Seas, either way this will mean a complete re-imagining for the entire park entrance area. Removal of the Leave-A-Legacy blocks, wider pathways, a larger security screening area, and retail outside the park exit are all possible changes we could see. Permits have been filed revealing that Disney is seeking to create a 30-acre site for the “temporary stockpiling of earthwork” near the Magic Kingdom area for an as-yet-undisclosed project. Rumor is this will be a new resort on the existing Monorail loop. If this is true, then there are several theories as to the location of this new resort. One option is the area between the Contemporary and the Ticket and Transportation Center. Some speculate this location would include a boardwalk with its own shops and restaurants that would connect the TTC to the Magic Kingdom via a pedestrian walkway. Having a way to walk from the park entrance to the TTC parking area would be great- especially when you have long waits for monorails and boats. Another option is to replace the convention hall space at the Contemporary resort. This area seems to be underutilized and the prime location could be better served with a deluxe resort, moving the convention facilities to the (currently expanding) Coronado Springs. Another potential site for a new hotel is in the middle of Bay Lake on Discovery Island (near the old River Country Park) This has the advantage of connecting the campgrounds to theWilderness Lodge, but isn’t on the monorail line which would let Disney sell rooms for a higher rate. The rumor is that Walt Disney World has ordered a new fleet of monorails from Bombardier, the world’s leading manufacturer of trains and planes. This is the company that made our existing monorails which have been in use since 1989. With the recent breakdowns and issues the monorails have been having, this seems like a plausible solution. While the +100 million price tag is steep, this will be an eventual need so it’s not really a matter of if, but when. The monorails are too widely used for transportation, and a big selling point in booking the resorts that are connected to it, so getting rid of them wouldn’t be an option. New monorail would be fantastic, and given the fact that delays and down times seem to be a regular occurrence, this could really enhance the overall guest experience. This was one of the slew of announcements we had back the D23 expo and it appears that the plans for this theater have been dropped. No word on why, as Disney hasn’t officially announced anything, but it seems clear that the projected construction plans for Magic Kingdom no longer have the Theater. This is a shame since we could really use a high quality stage show like the other Disney parks, but it could be that it’s just been put to the back-burner for now. Again, all of the above is unofficial, but I’ll be keeping an eye on updates as they come in.